Often dreamlike and enigmatic, Christine Brennan’s work features a host of symbolic and allegorical reference. Brennan’s images draw from the unconscious, leading the viewer into richly-lit narratives that evoke personal stories and associations. As a painter and printmaker, Brennan works in oil on paper or board and hand-colored linoleum block prints. Never setting out to illustrate a specific theme or story, the artist creates each image as she goes, changing and shaping it along the way. That each untitled image may call forth different interpretations is a balance the artist strives for. 2007 Figures & Forces, Jan Baum Gallery, Los Angeles, CA. 2006-2010 Hunter-Kirkland Contemporary, Santa Fe, NM. Owner: Nancy Hunter. 2006-2008 44T Artspace, Denver, CO.
2005 Birds of a Feather, with Ted Gall, HumanArts Gallery, Ojai, CA. Owners: Hallie & Stan Katz. 2004 Featured Artist: City of Ventura Artwalk. 2002-Present Iota, Dallas, TX. Owner: Dan Dean. 2002 *Recent Works by Christine Brennan, Utopia Design, Studio City, CA. Owner: Darren Frank. 2001 *The Imaginary World of Christine Brennan, Utopia Design, Studio City, CA. Owner: Darren Frank. 2000-2003 Every Picture Tells A Story, Santa Monica, CA. Owner: Lois Sarkisian. 1999 *Imaginary Friends, Carnagie Art Museum, Oxnard, CA. Curator: Susan Bellah. 1993-Present Ojai Studio Artists exhibiting member. 1991-2003 Running Ridge Gallery, Santa Fe, NM. Director: Carol Sorensen. HumanArts Gallery, Ojai, CA. Owners: Hallie & Stan Katz. 1988-2012 John Nichols Gallery, Santa Paula, CA. Owner: John Nichols. Featured Artist, Focus On The Masters, Ventura, CA. Directors Choice “Master in our Midst” Award, Carnagie Art Museum, Oxnard, CA. Best of Show, Ventura County Assembly of the Arts, Ventura, CA. City of Ventura, CA Municipal Art Collection, City Hall, Ventura, CA. Carnagie Art Museum, Oxnard, CA. Drew Barrymore, Los Angeles, CA. Jonathan Winters, Santa Barbara, CA. Sir Anthony Hopkins, Malibu, CA. Pat Richardson (of TV’s Home Improvement), Los Angeles, CA. Ventura County Museum of Art and History, Ventura, CA. Bank of A. Levy Collection, Ventura, CA. Work Purchased for the Film “When a Man Loves a Woman”, 1994. 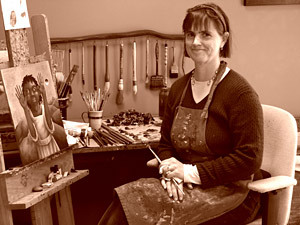 “Christine Brennan Paintings”, Pueblo Street Press, 2008. Stephanie Kinnear, “Art House”, Ventana Monthly, October 2006. Nicole D’Amore, “Symbolic Still Lifes Meant to Elicit Personal Response,” Ventura County Star, March 18, 2005. Psychological Perspectives: a Journal of Jungian Thought, winter 98/99. 1987 Bachelor of Fine Arts, Rhode Island School of Design, Providence, RI.